Boston head coach Ashley Coates. Photo: David Dales. The Blue and Whites host derby rivals Skegness at the Boardsides on Saturday as the Midlands 4 East (North) campaign comes to a conclusion. Following Saturday’s 39-31 victory at Ollerton, the Blue and Whites moved up to fifth spot in the table. Head coach Coates, however, knows Skegness will be no pushovers. “Although they’re a way behind us on points they’re a very capable side,” he told The Standard. 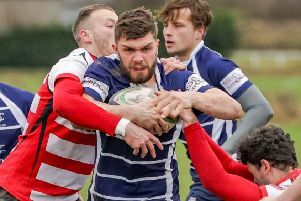 It will be a busy afternoon at the Princess Royal Sports Arena as the Firsts and Development side both host Skegness XVs, while the Rugby Rocks tournament - a two-day event featuring youngsters from across the country – will also be in full swing. It also happens to be vice-presidents’ day. “We’ve got two games on, the Firsts and Development side playing derbies against Skegness, and it’s our vice-presidents’ day, so hopefully we’ll have a good local crowd,” Coates added. “It’s important to put on a performance for them and also for ourselves so we can take that into next season. “I’ve said to the players that this could be their last chance to play together as a group. “Some people might come in and some people might leave.